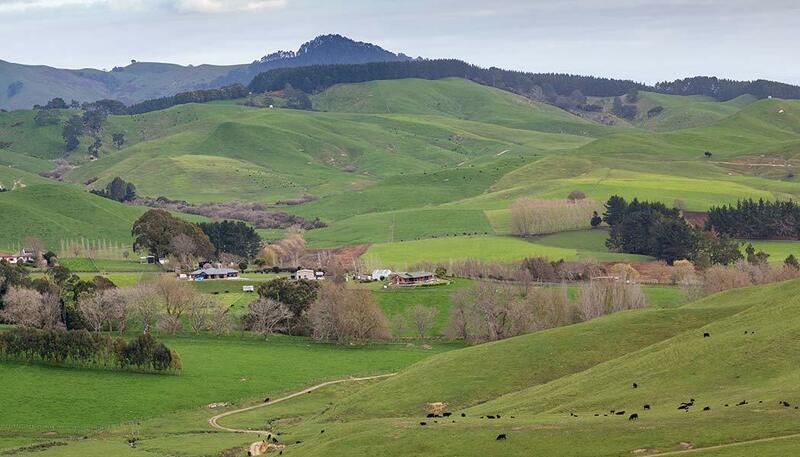 A widely-admired Waikato sheep and cattle farm is for sale. PGG Wrightson Waikato Real Estate Manager John Sisley is presenting 286 hectare Grassy Downs to the market for Neville and Carole Woodcock. John Sisley says the farm’s aesthetic appeal, exceptional presentation and quality location give it definite ‘x’ factor. “Situated in Tauwhare, Grassy Downs is extremely desirably located, 23 kilometres east of Hamilton, 18 kilometres north of Cambridge and 18 kilometres south of Morrinsville. Operated for many years as a conventional sheep and cattle breeding and finishing unit, under its current system all stock are bred and finished on farm,” says John. Neville Woodcock first came onto the farm in 1960 with his father Ray. “Dad previously had a dairy farm at Tamahere, near Hamilton. He started out as a carpenter with a market garden block in Onehunga, which he built houses on in 1927. He used the capital from selling those to buy the Tamahere farm with his father, Howard. Although he was a dairy farmer, Dad really wanted to go to sheep and beef. With relative farm values at the time, he was able to sell one hectare in Tamahere and buy five hectares here. “Dad set the two of us up in a partnership. I had been out of school two years, working with him on the dairy farm. He was a progressive thinker and over the years I gradually took a greater share in the farm,” says Neville. Initially they bought Grassy Downs as a going concern, taking the stock with the farm. A couple of years later, Ray and Neville bought 30 head of Angus cattle from a neighbour. “We used them as the basis of a herd that we have maintained ever since, improving our bloodlines by buying in high performing bulls from Mangapapa Stud in Kawhia. 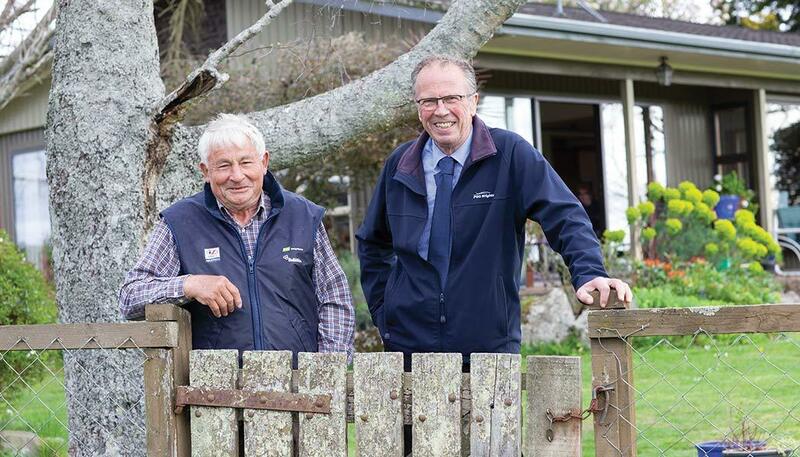 “With the sheep, as Waikato is susceptible to facial eczema, in 1990 we decided to buy rams for our Romney flock from Keith Abbott, also of Kawhia. His flock has among the best facial eczema tolerance in New Zealand, which helped tremendously. With the 40 per cent of ewes that go to a terminal sire, we use Texel rams, and have found the cross produces an excellent prime lamb,” says Neville. He married Carole, who taught languages in Hamilton, in 1969. They raised three daughters on the farm. In the beginning Grassy Downs relied on horses. “When we moved here there was no track to the top paddocks. We used a sleigh to feed out. I didn’t enjoy riding horses, and once motorbikes came in, in the early 60s, that suited me better. I was one of the first to buy a motorbike and have used them on the farm ever since. “We had major droughts in 2008 and 2014. Those years we sent all the cattle off the farm. In the first year they went to Waipu, North Auckland, and the second they went to Raglan. That was a smart decision. Sending them away early meant we didn’t have to rely on supplements or fret over stock health. By the time they came back they were still in excellent condition and we didn’t miss a beat,” he says. Grassy Downs’ proximity to LIC in Hamilton and Ruakura Research Centre attracts overseas VIPs. Combining breeding and finishing in a single operation, it is an obvious stop for delegations looking at best New Zealand farming practice. Visitors have included ministers of agriculture from the EU, the US, China and Korea, among others. Neville’s membership of Rotary has opened Grassy Downs to many other overseas visitors. “We organised an annual event for Waikato University’s overseas students for the past 25 years. 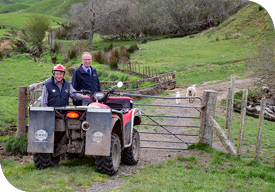 This gives an authentic New Zealand farm experience to between 60 and 80 students each year. We demonstrate shearing, show dogs working a mob of sheep and provide a barbecue. Overseas students enjoy it and it is great fun to host. We will miss it when we leave the farm,” he says. John Sisley rates Grassy Downs one of the best farms he has listed in 26 years marketing rural property. “Contour is predominantly easy hill, with approximately 25 to 30 per cent steeper, while the fencing, reticulated stream water, strong clean pastures and superior structural improvements make this the complete package. 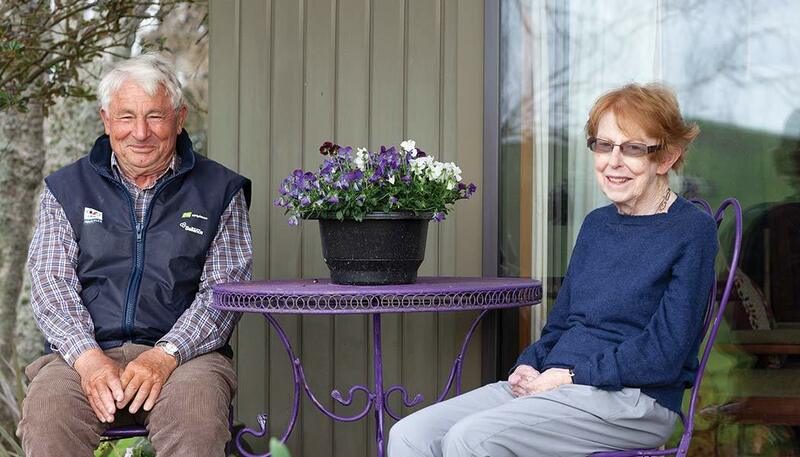 Neville and Carole have achieved 120 per cent lambing and 95 per cent calving rates in recent seasons. Grassy Downs lambs average 18 kilograms slaughter weight, with surplus cattle killed at around 340 kilograms hook weight. Neville and Carole farm Grassy Downs in conjunction with Chudleigh, a 65 hectare easy country block located two kilometres away, which is also available to purchase. “Waikato properties this size and scale are jealously guarded and rarely come to the market. Grassy Downs is one of the most appealing farms offered for sale in the district for several years,” says John. According to John Sisley, the North Island’s winter market for sheep and beef farms was buoyant. “With red meat returns so favourable, sector optimism is holding up well. Inquiry during winter, especially from potential vendors, was markedly higher than through an average winter. Plenty of potential buyers will take an interest in an exceptional listing that ticks as many boxes as this one,” he says. Currently carrying around 4500 stock units, comprising approximately 50 per cent sheep and 50 per cent cattle, Grassy Downs is for sale by tender, with offers sought by or before 20 November.